By Allison Owen I've been home for a couple weeks, but I've just now gotten "back to reality" and had a chance to write about this summer. It's hard to sum up the incredible time I had, but I'm going to try. This summer was an amazing and life-changing experience for me. We grew as a corps and as individuals throughout our time together and we ended the season as finalists. Our placement didn't matter, though, because we had such a great time. Don't get me wrong, it was nice to come out of it being as successful as possible. 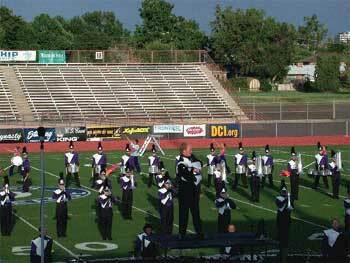 I had the time of my life and I'd give anything to be back in drum corps right now. It's crazy how I find myself missing things like holding my plate while I eat sitting on a curb or standing in a parking lot, sleeping on a dirty gym floor, and being in the heat all day, but I do. I'd be lying if I said there weren't days when I just wanted to be at home, but now that I'm at home I'd give anything to be back in rehearsal. Corps life was so fast-paced, I was used to doing things all the time and not having a break. It was stressful at first, but once I got used to it, I began to enjoy that way of life. Now that I'm back in school, life is much slower and less entertaining. I often find myself staring out the window, daydreaming about this summer. Then I snap out of it and realize that the person standing in front of me is not telling me segment we're going to clean or which counts are where, but instead how to write the decomposition of a function. Obviously I'd prefer the first any day. I've also come back to band, and I've had to jump right in and learn drill and work. It's different in so many ways that I can't even begin to describe, but I've had to just get right in because we have a performance in less than a week. People are somewhat surprised that I pick up stuff quicker than I used to, but stuff would change all the time in corps and it was put in that night so I had to learn things quicker. Whenever I'm about to get frustrated with something, I have to remind myself that band and corps are two completely separate things. People may not understand why I run back to my set, but that's OK because that's what I'm used to doing. At school my friends and I will sit around at lunch and talk about our days. It's pretty often that something will remind them of something that happened at band camp or when they were on vacation and they'll talk about it and laugh. Then something will remind me of something that happened in Kalamazoo this summer and I have to hold it in because they wouldn't understand or be interested. It's sort of hard when no one is really interested in hearing about the time in Illinois when the showers flooded, or when we were in Kansas and our scaffolding began to sink into the asphalt. Those are the memories I have to keep in my heart and remember forever. Whenever I see friends from corps we can reminisce about those good times, but people who haven't marched really don't understand what a corps goes through during a season together. This summer I made lifelong friends and memories that I will never forget. I met so many people this summer-in my corps and others-and I miss them a lot. These are people I would trust with my life. I know I can count on them to listen to me when I'm having a bad day-and I'd do the same for them. We've been through a lot together and we understand each other better than anyone else can. A song will come on the radio or I'll pass something driving down the street and I'll have to call someone from corps because it reminds me of them or we have an inside joke about it. Overall drum corps is an incredible experience that has helped me in so many ways to become a better person. I would recommend it to anyone who is interested in the activity at all because I had such a great time. This summer is one that I will never forget and I wouldn't trade it for anything.